Palestinian protesters carry an injured man who was shot by Israeli troops during a protest at the Gaza Strip's border with Israel, May 14, 2018. Dozens of Palestinians were killed and more than 2,000 wounded in clashes with Israeli forces Monday along the Gaza border as thousands demonstrated against the opening of a new U.S. embassy in Jerusalem. While U.S. and Israeli officials celebrated at the new American diplomatic outpost, violence raged less than 100 kilometers away. The Israeli military said more than 40,000 people protested, with Palestinian health officials saying 52 demonstrators were killed by live gunfire and tear gas. It was the deadliest day of violence in Gaza since 2014 during the war with Israel. As the death toll mounted throughout the day, some countries, including U.S. allies France and Britain, called for restraint on Israel's part to curb the bloodshed. But the U.S. did not join the call for Israel to limit its response to the protests and laid the blame for the violence on the militant group Hamas that controls Gaza. A teenage boy prepares tires to burn in protest of the U.S. Embassy in Jerusalem opening, in the Gaza Strip, May 14, 2018. "We shouldn't lose sight that Hamas is responsible for the entire situation," White House spokesman Raj Shah said. He accused Hamas of "engaging in cynical action" to promote the protests against the Jewish state and the U.S.'s action in moving its embassy from Tel Aviv to Jerusalem even as most countries have kept their diplomatic operations in Tel Aviv. As the U.S. embassy was opened, U.S. President Donald Trump, in a video message, proclaimed Jerusalem as "the capital of Israel." 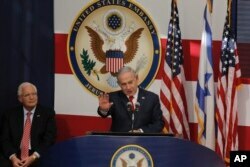 Israeli Prime Minister Benjamin Netanyahu declared, "We are in Jerusalem and we are here to stay." Shah said the Gaza violence and the opening of the embassy in Jerusalem, the eternal city of Jews, Christians and Muslims that the Palestinians also hope some day to claim as their capital, would not affect U.S. efforts to forge an Israel-Palestinian peace accord. But any semblance of peace was far from a reality along the Gaza border, where protesters massed along the dividing fence. 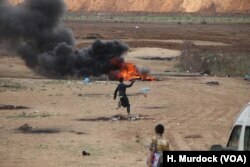 Clouds of black smoke from tires set afire by the protesters filled the sky. Palestinian teenagers throw rocks towards the Israeli border, often in a symbolic attack as the rocks on this day generally to not reach the fence, May 14, 2018 in the Gaza Strip. Some demonstrators hurled stones, firebombs and explosives at Israeli security forces, who responded with tear gas and gunfire. Netanyahu said on Twitter, "Every country has an obligation to defend its borders. The Hamas terrorist organization declares it intends to destroy Israel and sends thousands to breach the border fence in order to achieve this goal. We will continue to act with determination to protect our sovereignty and citizens." Trump defied the sentiment of many governments around the world in December by upending longstanding U.S. policy to move the American embassy to Jerusalem. 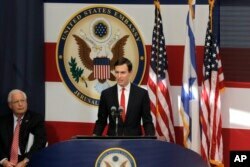 White House senior adviser Jared Kushner, right, speaks as U.S. Ambassador to Israel David Friedman listens during the opening ceremony of the new U.S. embassy in in Jerusalem, May 14, 2018. In one of the few references at the celebration to the Gaza protests, Kushner called the Palestinians protesting in Gaza "part of the problem and not part of the solution." In his video remarks, Trump described the moving of the American diplomatic outpost to Jerusalem as "a long time coming." But the U.S. leader said the United States "remains committed to a lasting peace agreement" between Israel and the Palestinians. In Twitter remarks from Washington, Trump said, "A great day for Israel!" and congratulated the country. But he did not mention the violence. Netanyahu called the opening of the new embassy a "glorious" day, saying, "Thank you, President Trump for having the courage to keep your promises." The prime minister applauded Israel's security forces for protecting its borders. Israel's Prime Minister Benjamin Netanyahu delivers his speech as U.S. ambassador to Israel David Friedman listen, during the opening ceremony of the new U.S. embassy in Jerusalem, May 14, 2018. Arab leaders condemned the U.S. action, with Lebanese Prime Minister Saad Hariri calling the embassy move "provocative" and Iranian Foreign Minister Javad Zarif describing it as "a day of great shame." Palestinian President Mahmoud Abbas said he "will not accept" any peace deal with Israel that is proposed by the Trump administration. He said the new U.S. facility in Jerusalem "is not an embassy, it's a U.S. settlement outpost in Jerusalem." Critics have faulted Israeli forces for using live fire, while Israel says its actions are necessary for security as people threaten the border fence. 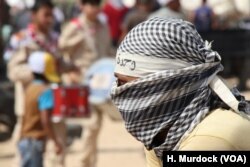 The Israeli military said it launched five airstrikes in Gaza on training camps of Hamas militants. 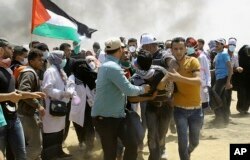 Palestinian protesters evacuate a wounded youth near the Israeli border fence, east of Khan Younis, in the Gaza Strip, May 14, 2018. European Union foreign policy chief Federica Mogherini called on Israel to respect the "principle of proportionality in the use of force" and should act "with utmost restraint to avoid further loss of life." Along with rejecting the U.S. Embassy move, Palestinians were also protesting to mark the anniversary of what they call the "nakba" or "catastrophe" in reference to the hundreds of thousands of Palestinians who were expelled or fled during the 1948 war surrounding Israel's creation. The new U.S. Embassy site is an interim location operating inside the existing U.S. consulate building in Jerusalem while a search begins for a larger site. Trump pledged during his campaign to move the U.S. Embassy to Jerusalem. After announcing in December that the embassy would be moved, the U.N. General Assembly overwhelmingly adopted a resolution rejecting Trump's decisions regarding Jerusalem. U.S. Treasury Secretary Steven Mnuchin said that moving the embassy "is a national security priority" and that Trump "wanted the American embassy real estate on the right side of town" in Jerusalem. U.S. President Donald Trump's daughter Ivanka Trump, right, and U.S. Treasury Secretary Steve Mnuchin attend the opening ceremony of the new U.S. embassy in Jerusalem, May 14, 2018. Israel sees all of Jerusalem as its capital, while most Palestinians hope to see East Jerusalem as the capital of a future Palestinian state. The issue has long been seen as one of the last big items that would need to be resolved in any Israeli-Palestinian peace deal. Heather Murdock contributed to this report.